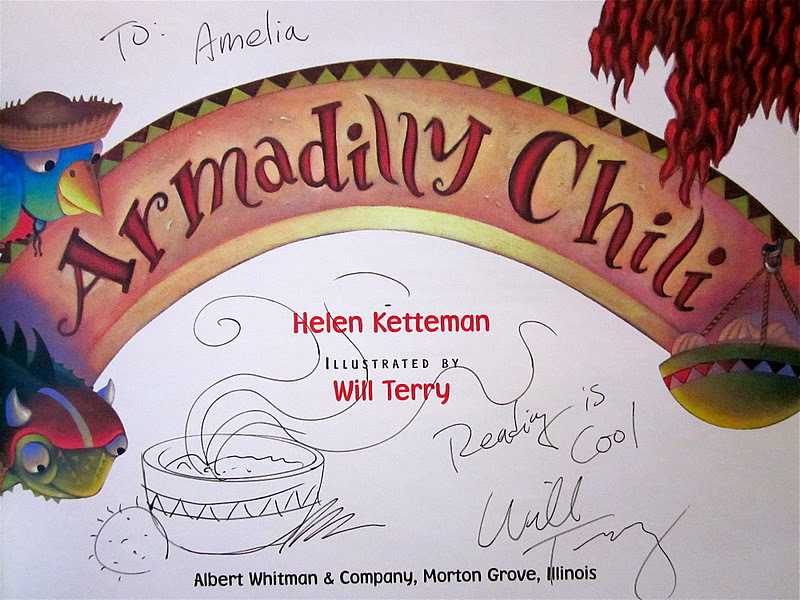 (Ages 5-8) A blue norther's a-blowing', and Miss Billie Armadilly is hankering to make a pot of chili! Only she needs to fix it all by herself because Tex the tarantula, Mackie the bluebird, and Taffy the horned toad are too busy to lend a hand. Well, she'll eat it all by herself, too! But then the smell of chili cooking in the cold night brings her friends one by one back to Miss Billie's door. 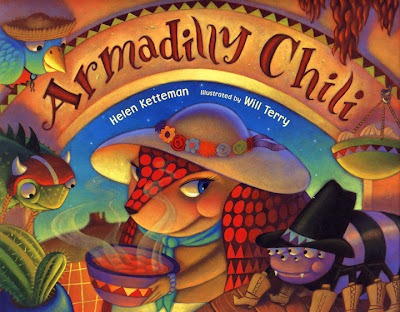 What's a lady armadillo to do? Here'a PDF file of activities to go along with the book! Will Terry lives locally and is the illustrator of over 25 children's books. He recently began producing his own children's eBooks including Monkey & Croc and Tickle Bugs as well as iPad apps! And along with teaching college art classes, Will has also created several video tutorials as part of the Folio Academy, an online art school that Will started with fellow artist Wayne Andreason. Will has even created a video series for elementary schools! I first met Will Terry at the Provo City Library's Children's Book Festival this past May where he autographed books and drew on his iPad, the image of which was projected onto a screen so that everyone could see his mad skillz. It was pretty awesome. He's super good at digital art (see below) which I assume makes him more valuable in today's picture book publishing world. Just FYI for those of you who own an iPad; Will uses the Targus brand stylus. In particular, he has the one with the pen on the opposite end to the rubber tip (Dude, now there's one with a laser pointer too. A 3 in 1! great for a teacher, I bet). I had one and it was great, but sadly I lost it (me thinks my Wee One put it in the trash can unbeknownst to us). Oh well! Christmas present! He also uses the Brushes digital painting app (see below for some Will Terry Brushes mega coolness). Along with all of the links within this post, please also check out Will Terry's illustration blog! In a skillet, cook beef over medium heat until no longer pink; drain. Transfer to a slow cooker. Add the next nine ingredients. Cover and cook on low for 8-10 hours or on high for 4 hours. Garnish individual servings with cheese if desired.